Insta360 Nano Review and Insta360 Air Review. The Nano works with your iPhone and the Air on an android phone. Both are 360 degree cameras that take photo, video and live stream to many places e.g. Youtube and Facebook. The Insta360 cameras come with the best mobile apps that are ahead of that provided by Samsung for their Gear 360 (2017). Why? Find out in my video review. The video review provides a practical in depth review of both cameras. The main review include some sample footage that I could embed however there were many modes that were not included and consequently are shown below. My review also includes a DIY way to attach the Insta360 Nano to an iPhone whilst it is still in a case. 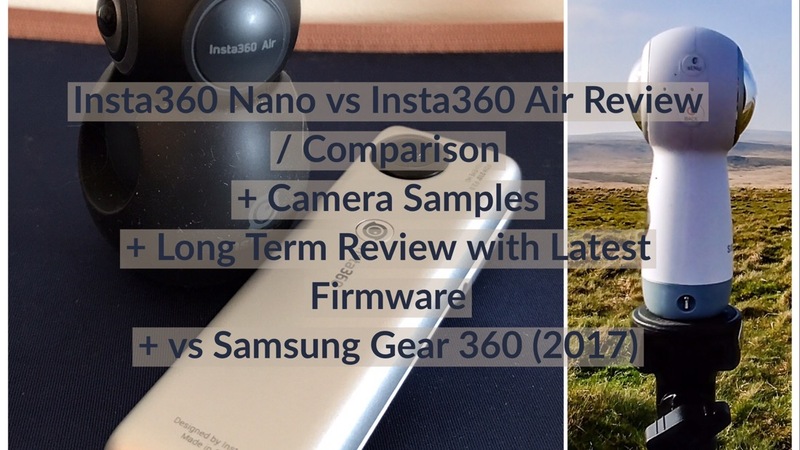 Finally, I have also provided a comparison between the two Insa360 cameras along with my views using these with the Samsung Gear 360 (2017). At the end of this post, I have all the useful links. Both cameras are excellent, versatile and solve the key issue, how to share the footage in a fun and easy way to nearly every social media platform.